This Aroma rice cooker gets a 4 1/2 star out of 5 star rating with over 117 reviews at Amazon alone. A lot of the foods we eat lose nutritional value due to the traditional cooking methods, such as boiling and frying. This handy rice cooker helps you lock in the nutrients, so your meals taste great while being extra nutritious. 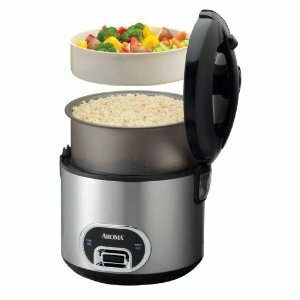 If you're interested in cooking healthy meals for your family, the Aroma ARC-838TC 8-Cup Digital Rice Cooker and Food Steamer could be just what you've been looking for. Do you want to prepare small or large meals in one easy step? If you answered yes, then you need to find out the facts about this rice cooker. One of the nicest features of this product is its huge capacity. You can easily prepare anywhere from 4 to 16 cups of cooked rice, which correspond to 2-8 uncooked rice cups. Make sure to use the measuring cup that comes with the rice cooker as this is not a regular full measuring cup size, it is smaller in size (180ml) that is common in the rice industry. It also has a digital programmable control panel that transforms this device into the perfect cooking assistant with helpful features, like a delay timer. This function allows a delay of up to 15 hours, to make planning meals in advance a snap and the automatic warmer keeps the rise warm for up to 12 hours. Cleaning: Nothing is dishwasher safe. You must hand wash with warm, soapy water and a sponge or dishcloth. After washing make sure the inner pot is complete dry both inside and out. Any moisture on the outside could cause the cooker to malfunction. Make sure to remove and clean the steam vent located in the lid of the cooker. Warranty: One year limited warranty from defects in material and workmanship. To help with the problem with rice sticking, one customer commented that the directions state to add an extra cup of water-depending on what type of rice your cooking. If you like your rice softer, Aroma advises that you let your rice soak 10 to 20 minutes before cooking. To help reduce sticking, rinse your rice before placing it in the inner pot. If you are a fan of brown rice you might want to consider a different model like the Arc-856 with "Sensor Logic". Customers report that ARC-838 is just decent for cooking brown rice. It can also be used for various other foods such as vegetables and meat. You can even use it to cook savory stews. You can easily add other ingredients of your choice, such as vegetables and meat while cooking your rice. Its good, when you are considering a purchase, to know what real life customers are saying about it. 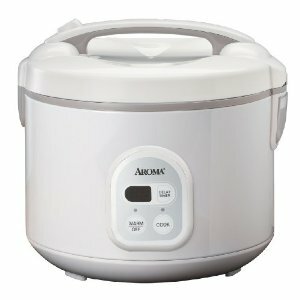 We searched for customer opinions about to the Aroma ARC-838TC 8-Cup Digital Rice Cooker and Food Steamer. Most customers are very satisfied with all of this model's features. It proves to be a very reliable device and many people who are using it really consider that it is the best rice cooker they've ever used. Customers have reported loving the Aroma's cool to the touch exterior that makes it easy to handle. The common complaint was that the Aroma rice cooker burned or overcooked the rice when left in the warm mode. One customer noted that the steamer emits a starchy steam while cooking which can coat your cabinets and counters. If you really like to cook and want to make tasty, healthy meals, the Aroma ARC-838TC 8-Cup Digital Rice Cooker and Food Steamer really deserves your attention. It's a great buy for cooks of every experience level, from beginners to professionals. If you cook on a regular basis, you owe it to yourself to check out this handy rice cooker. There simply aren't many kitchen accessories that make meal planning and preparation as easy as this product from Aroma does. Many online stores had it priced at around $45.00. We found the best price at Amazon and ships free with super saver shipping. This rice cooker makes the preparation of healthy, delicious meals as easy as 1, 2, 3. You don't have to settle for undercooked or overcooked meals when you use the Aroma ARC-856 6-Cup Sensor Logic Rice Cooker and Food Steamer. This cooker is built with all the features and functions you need to make great meals every time you cook. Even if you don't consider yourself the best cook, you'll agree that the Aroma ARC-856 6-Cup Sensor Logic Rice Cooker makes delicious meals with minimal preparation a snap. The "Sensor Logic" is Aroma's name for "Fuzzy Logic" cooking. Many electric rice cookers heat only from the bottom at a set temperature and turns off once all the water has been absorbed. The Aroma 6-Cup rice cooker uses an all around heating system that maintains the optimal cooking environment for the perfect rice. The micro computer chip controls heating in a way that optimizes the cooking temperature of the rice to enhance flavor and texture. This sensor monitors the boiling rate of the water and adjust the temperature accordingly. The Aroma ARC-856 has a cooking capacity of 4 to 12 cups of cooked rice or 2 to 6 cups of uncooked rice. Definitely large enough for a family of 4 or larger. As with all rice cookers, make sure to use the measuring cup that comes with the rice cooker as this is not a regular full measuring cup size, it is smaller in size (180ml) that is common in the rice industry. There are preprogrammed settings for all sorts of meals that allow you to choose just the right slow cooking setting to make your meals a success. The preset buttons include a 1-hour porridge/soup and a 2-hour slow cook. The Aroma ARC-856 features a delay timer can only be used when cooking rice and not for slow cooking or porridge/soup. You have the option of choosing either the "white rice", "brown rice" or "sushi rice" rice functions. When cooking with white rice function the cooker cooks the rice until all water is absorbed. The brown rice function soaks the rice for 20 to 30 minutes before cooking and then cooks the rice at a lower temperature for a longer time turning out light, moist and tender brown rice. The sushi rice setting gives you a shorter cooking time, which produces a firmer textured rice. Cleaning: The rice cooker is not dishwasher safe. Wash the inner pot, steam tray, steam vent and all other accessories and warm soapy water with a nylon sponge or dishcloth. The underside of the lid and a heating plate should be wiped with a warm damp cloth. It has a retractable cord which makes for easy storage. The Aroma Sensor Logic Rice Cooker also includes a water reservoir to prevent excess water condensation. With the Aroma ARC-856 you can easily cook vegetables, meat, stews, soups, and, of course, rice. The manual that comes with the cooker explains very well on how to use it for cooking other food items. Some customers have experimented with cooking in the rice cooker, and have made perfect polenta, pasta salads, oatmeal and one reviewer thinks it is perfect for summer cake baking. The maximum capacity of this unit is 6 cups raw white rice which yields 12 cups of cooked rice. If you are cooking brown rice then the max is 4 cups which will yield you 8 cups of cooked brown rice. If you plan on cooking brown rice with the Aroma ARC-856 don't be in a hurry. Two cups of uncooked brown rice will take about 1 hour and 45 minutes to cook. Aroma recommendeds that you rinse your rice before placing it in the inner pot. Which will help reduce sticking or browning to the bottom of the inner pot. Plenty of online buyers raved that this is one of the best rice cookers on the market today. Online reviewers seem to love its features and capacity too. Many commented on how easy it cleaned up and that it was easy to store with all the attachments fitting inside. We really could not find any drawbacks from customers on the performance of the rice cooker. One customer was disappointed that the manual contained no rice recipes and another reviewer had a problem with the rice cooker switching automatically to warm in the porridge setting. Top all of that off with easy clean up and you can understand why the Aroma ARC-856 6-Cup Sensor Logic Rice Cooker and Food Steamer is so popular with customers. At the time of writing this review Amazon had the best price and it shipped free with super saver shipping. This Aroma 10 cup rice cooker features a cool to the touch stainless steel exterior and a large cooking capacity of up to 20 cups of cooked rice. You'll love getting the the same results each and every time you use it so that you can always enjoy well-cooked meals with tender, delicious rice as on the side. This rice cooker also has a helpful reservoir which channels away the excess condensation. 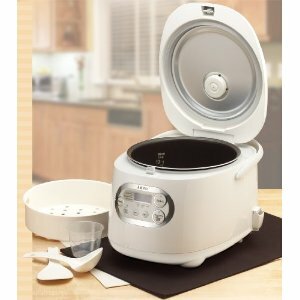 The Aroma ARC-940SB Rice Cooker can prepare up to 20 cups of cooked white rice (10 cups uncooked)at a time. Due to the extra water that brown rice needs when cooking, this Aroma rice cooker can only cook 8 cups of uncooked brown rice which gives you 16 cups of cooked brown rice.. The water lines that are marked in the inner pot are for cooking white rice only. So if you are cooking brown rice, you will need to refer to the manual for the correct cooking ratios. Remember that the measuring cup that comes with the rice cooker is not a regular size U.S. cup, but one the adheres to the rice industry standards of 180ml. The ARC-940SB doesn't have the programmable features that the ARC-856 and ARC-838TC feature. It has a simple one-touch power switch to start the cooking and automatically goes to a warming mode when the rice or other foods you have cooked are done. You must unplug the rice cooker to turn it off. Keeping it plugged in will make the rice cooker stay in the warm mode. Aroma suggest that you do not leave the cooker in the warm mode for more than 12 hours. Cleaning:The rice cooker or any accessories are dishwasher safe. Simply wash the inner pot in warm soapy water and wipe the exterior with a damp cloth. The underside of the lid is removable and should be cleaned in warm soapy water after each use. We were able to find quite a few customer reviews while researching for this Aroma 10-Cup Rice Cooker review, and nearly all of them were positive. Many reviewers commented on how it turned out perfectly fluffy cooked rice every time. At around $50.00 they thought the rice cooker was an excellent product for the price. In reading the reviews, we found a few customers that had a problem with the rice becoming brown, burnt or dried out when left in the warming mode. We found that a few online retailers had this rice cooker priced below $50.00, but most where out of stock on them. Amazon had a comparable price and shipped it free with super saver shipping.